A self-styled Indian guru and 14 others have been sentenced to life in prison for murdering four women and an 18-month-old baby in 2014. The court in Haryana state convicted Rampal last week. He was also found guilty of another murder and will be sentenced in that case on Wednesday. The victims suffocated after they were locked in a room while his supporters and police clashed, the court said. The guru claims tens of thousands of followers and has ashrams across India. Sentencing was announced amid tight security at the court in the northern city of Hisar in Haryana state, reports BBC Punjabi's Sashi Kanta. Rampal: How did an engineer become a revered guru? Rampal's lawyers told the BBC they would appeal against the sentence. The court heard that four women and the baby were found dead inside a tiny locked room in the ashram after the bloody standoff, in which at least six people died. A fifth woman found in the same room was taken to hospital but did not survive. Sentencing in her murder case is due on Wednesday. He was first accused of involvement in a murder case dating from 2006 in which a man died in a clash at one of his ashrams. He denied the allegations and was released on bail. The authorities ordered his arrest on contempt charges after he repeatedly failed to appear in court. A ruling is awaited in this case. Rampal refused to surrender to the police when they reached his fortress-like Satlok Ashram in Barwala, in Haryana state, in November 2014. Thousands of his supporters clashed with police and stopped them from entering the ashram. Many people suffered injuries during the week-long standoff. Police accused the guru's armed devotees of holding people hostage, and using women and children as human shields. 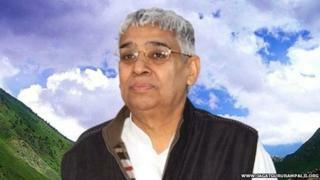 Rampal was born in 1951 to a farming family in India's northern Haryana state. After his diploma in engineering he began working for the local government and became a disciple of a seer. He began giving talks to groups of people in 1994. Encouraged by his growing number of devotees, he set up the an ashram in 1999. A year later Rampal resigned from his government job. It grew from there and he now has tens of thousands of devotees in several states. Rampal claims that "thousands of people have got their chronic illnesses cured" and "ruined families have become prosperous again" after coming in contact with him.